We are pleased to announce that Specialised Orthotic Services are exhibiting at Disability Action 2014, The King’s Hall Pavilions, Belfast. 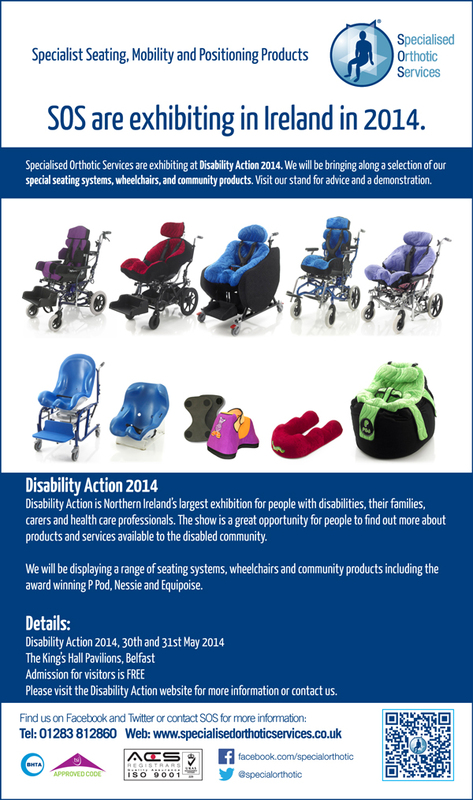 We will be bringing along a selection of our special seating systems, wheelchairs, and community products. Visit our stand for advice and a demonstration. This is a great opportunity for people living in and around Belfast to find out more about our products. Disability Action is Northern Ireland’s largest exhibition for people with disabilities, their families, carers and health care professionals. The show is a great opportunity for people to find out more about products and services available to the disabled community. We will be displaying a range of seating systems, wheelchairs and community products including the award winning P Pod, Nessie and Equipoise. Please visit the Disability Action website for more information or contact us.